Get Your FREE Market Report Now! For five decades and three generations, West Austin Properties has been passionately committed to the core values that guide it. Highest integrity in every relationship. Unsurpassed knowledge of Austin and the ever changing real estate market. Educating and empowering our clients so that they can make decisions that best meet their unique needs. Focus on the people and not the real estate; the quality of our service not the volume of our business. Build on the strengths and talents of our team’s generational blend . Improving our community through service and mentorship. West Austin Properties began as a small niche family owned real estate company in one of the oldest and most alluring parts of town, West Austin. Punctuated by hills, lakes and gorgeous 100 year old oak trees, West Austin has long captured the hearts of many. From my great grand father who served in the State legislature at the turn of the century, to my grand parents who were the first family on Indian Trail in Tarrytown when it was just a dirt road, to my childhood and that of my children, generations of my family have lived and loved Austin as it grew from a sleepy little town on the banks of the Colorado to the impressive metropolitan city of 1.8M people that it is today. Today, three generations of our family have served the Austin community with their real estate needs. Each generation has mentored the next bringing new skills to old foundations and business practices giving us more tools to better serve our clients. And, we still operate with the same core values upon which the company was founded. The focus will always be on the people we serve and the quality of our service. We love Austin and we love our business! Doing relocation work is also a passion. Laura loves to connect clients and their families to all of the people and services that make their relocation a success. Whether it is matching a special academic setting or finding a job for a spouse, her team makes the process seamless. A recent client commented, “I can’t believe how stressful this move would have been without the team at West Austin Properties.” When recruiting and relocating employees, the human resources departments in many area companies consider the skills and services of the West Austin team to be a valuable resource. A graduate of the University of Texas at Austin with two degrees, Laura has been married to husband, Brad since 1981 and they have two adult daughters, Kerry and Katy. “This is a family business. My father and grandfather taught us to treat each client like they were family. What greater joy can one have then helping a family member with the purchase or sale of a home?” Laura and the whole team carry on that tradition. Katy Duggan Freshour has real estate in her blood and a passion for serving home buyers and sellers. She is a native Austinite and a third-generation Realtor, seeking to continue a family legacy of excellence and commitment to customer satisfaction. Katy works with a wealth of experience including lifelong training from her mother, Laura Duggan. This is a priceless advantage and strong foundation as Katy displays her own proven creativity and innovation inspired by the latest training in technology, design and advertising. Add highly honed negotiating skills, and Katy is well prepared to put her home buying and selling clients in a position of strength in today’s market. Her professional credentials also include a degree in strategic communication, advertising and public relations from Texas Christian University. A competitive spirit and genuine heart for service drive Katy to do her very best for every client, every day. Katy continues to make a positive difference in the lives of the special people she assists. 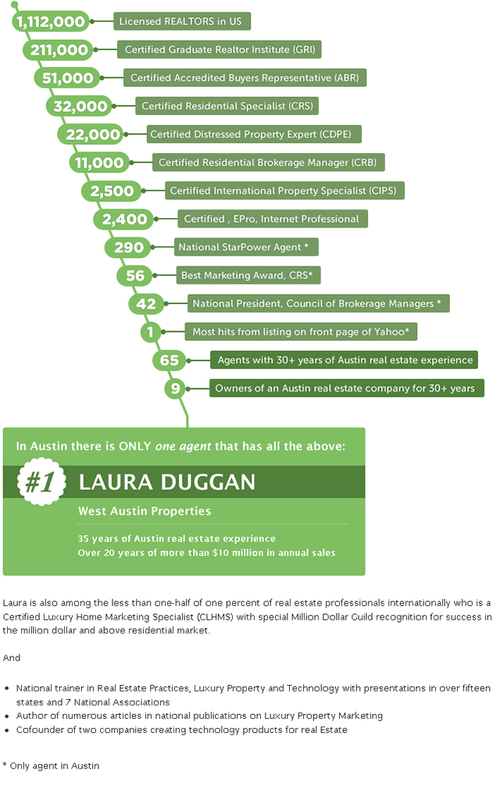 Brad Duggan has been an active part of the development of West Austin Properties since his wife, Laura Duggan, and her father started the company in 1979. At that time Brad and Laura were acquiring rental property throughout the Austin area and he worked behind the scenes to provide data and statistics and analyze the market to help Laura position the company to give it a strategic advantage. For 20+ years, Brad was Executive Director of the Texas Elementary Principals and Supervisors Association serving 5,000 administrators who represented over 2.4 million students. In this role, he was lobbyist for the organization, coordinated all legal services and directed all statewide and regional meetings. He was also elected Chairman of the Texas Society of Association Executives, which served over 1,100 associations. For 10 years Brad was President of the National Center for Educational Accountability, an organization created to work with all of the state and federal government education agencies to identify and investigate best educational practices, improve educational data quality and create more effective educational systems. The Center was a research unit of the University of Texas and included national organizations as part of the governance structure. He traveled extensively researching and developing technology systems, identifying key metrics, and reporting systems to enhance school achievement. Brad still serves as an advisor to several educational associations. Brad now serves as Chief Operating Officer of West Austin Properties and coordinates the team’s overall operations. He takes his background of creating and dispersing information through advanced technology into the real estate field by building and coordinating systems to utilizie social media, video blogging, and an interactive website, giving valuable knowledge and resources to our team and their clients. He researches, collects and analyzes the Austin market to foresee future trends, as well as capitalize on the current market conditions.